Under the overrides page at both GSM and Site level, you can now import overrides from existing sites. This procedure is useful for administrators who wish to copy identical overrides from one site to another, instead of manually having to create the same override for each site. For GSM Super Admins, this also means they can pull up overrides from a site, to then make global, and apply to all other sites which have the global overrides option selected. From the main GSM console, click the Gobal Settings tab. The system displays the Import Overrides window. 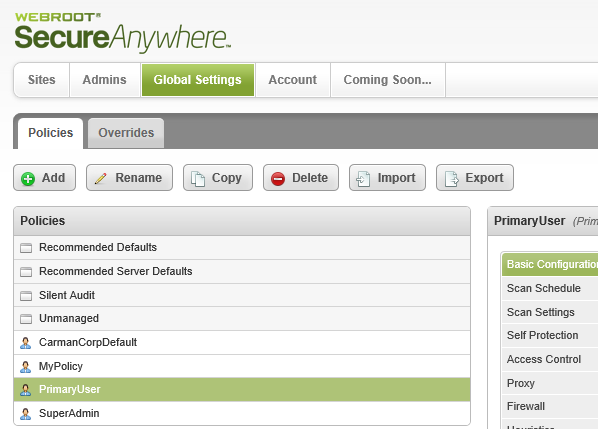 From the Site to import overrides from drop-down menu, select the site from where you want to import overrides. Remove Redundant Overrides — Ensures that no duplicate overrides are imported from selected import site/console. Overwrite Existing Overrides — Replaces the overrides currently in the GSM with those selected to be imported. Note: We recommend that you use this checkbox with caution as selecting the Overwrite Existing Overrides checkbox will delete all existing overrides, and replace them with the overrides that you want to import. Include Policy Based Overrides — Allows the importation of overrides created in the Standard Console that were assigned only to a particular policy within the selected import site/console. Note that ability to assign overrides to a policy is a feature only available in the Standard Console. When you’re done, click the Import button. The system imports all overrides from that site into your currently selected site.